As tradition goes, white is the undisputed choice of weddings but these days we find more and more of our customers are willing to add colour to their outdoor wedding ceremony in subtle ways to ensure the styling is unique and memorable. We love adding colour to our outdoor wedding settings. It allows us and our clients to get a little more creative with the wedding style. Our coloured wedding sashes are a great way to incorporate a colour theme without compromising on the traditional white wedding look. Coloured sashes added to the last row of chairs achieve a subtle but effective, minimal colour style. At Adorable Wedding Concepts we have 52 different coloured sashes to choose from. Go one step further and expand on your colour choice with decorative aisle features such as our coloured floral buckets available in a range of colours. For those that are really looking to move away from tradition, we have black aisle runners. We’ve completed a few weddings in the colder months where black has been the theme. It can create a very unique look when combined with other colours. 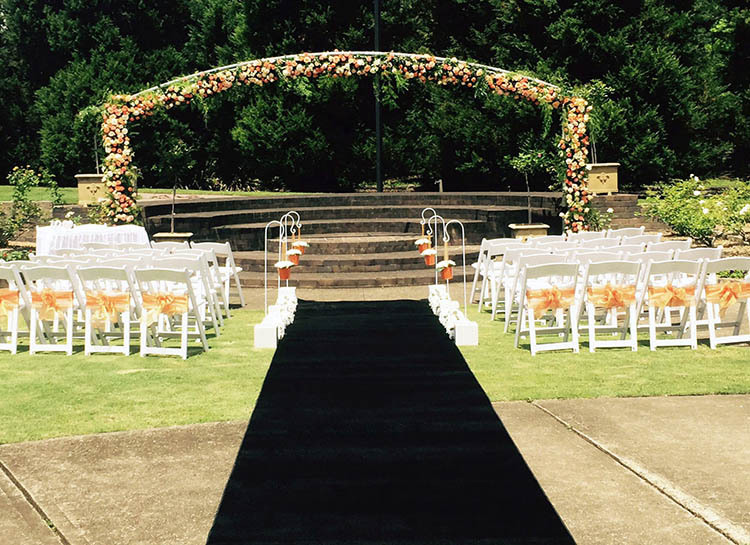 Jump over to our Auburn Botanic Gardens page to see a black wedding aisle in combination with orange. Other creative ideas for colour can include, lighting, bright colourful flowers, shoes/socks and jewelry. You’ve decided on an outdoor wedding ceremony but you’re not sure where to start? 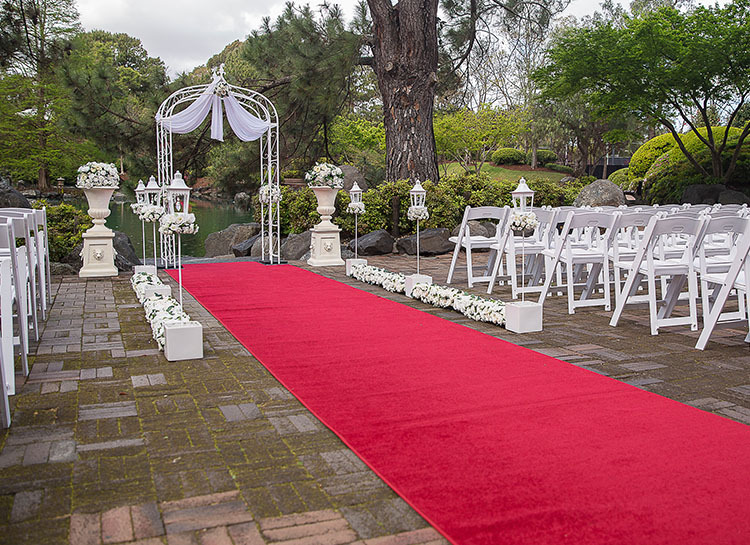 Adorable Wedding Concepts is an expert in outdoor wedding ceremony styling and having been operating since 2001 we’ve pretty much covered most of Sydney’s garden wedding venues. We’ve created a guide of some of our favourite locations which by all means is not a complete list of what is available but it incorporated as much detail as possible about popular venues to help you make with your decision. We highly recommend visiting the venue for yourself and directing your venue hire enquires directly to the venue authority. If you’re considering booking your outdoor wedding ceremony with Adorable Wedding Concepts, we’re happy to consult with you onsite and provide feedback and ideas based on our years of experience. Beautiful garden lawns with sweeping harbour views, it’s hard to go past the Royal Botanic Gardens Sydney, for a water view outdoor wedding ceremony. Some of our favourite lawns include: Bennelong Lawn, the Rose Garden, the Herb Garden, Harbour View Lawns (Lawn 33 & 34). Toilet facilities available. Proximity is dependent on the garden location. Located right next to the Sydney Harbour Bridge, Hickson Road Reserve is a beautiful location. Setup faces east with the Sydney Opera House creating a wonderful backdrop. See more of our Hickson Road Reserve pictures on the easy weddings site. 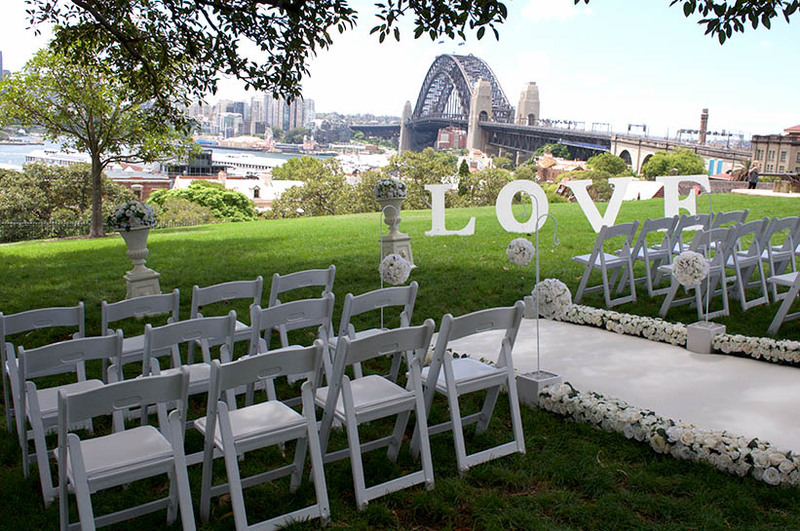 Perched high over Sydney Harbour, Observatory Hill offers up the Sydney Harbour Bridge as a backdrop to your outdoor wedding ceremony. There are two locations to choose from; Front Gardens or Rotunda. 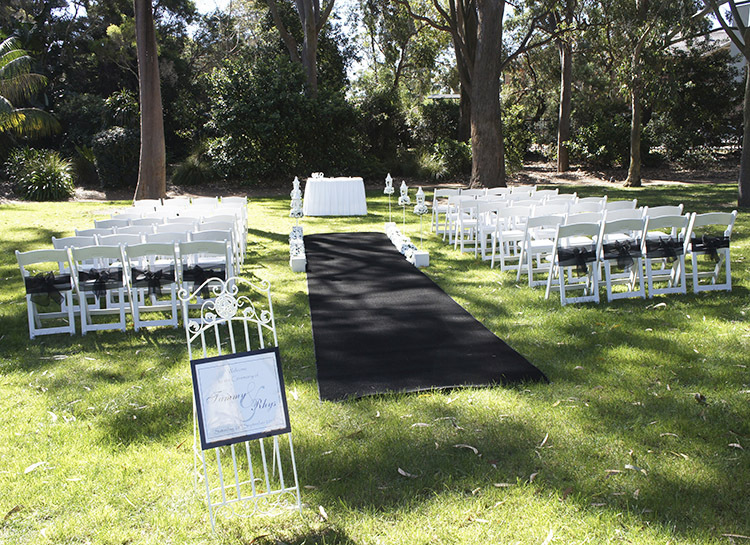 Located in Sydney’s west, Nurrangingy Reserve has a number of outdoor wedding location within the 63 ha grounds. The Nurrangingy Wharf sits across an area of the pond directly outside The Colebee Centre and is a very popular location with the reception venue just meters away. Bungarribee Pavilion sits on top of the overlooking the grounds, providing a picturesque outlook. 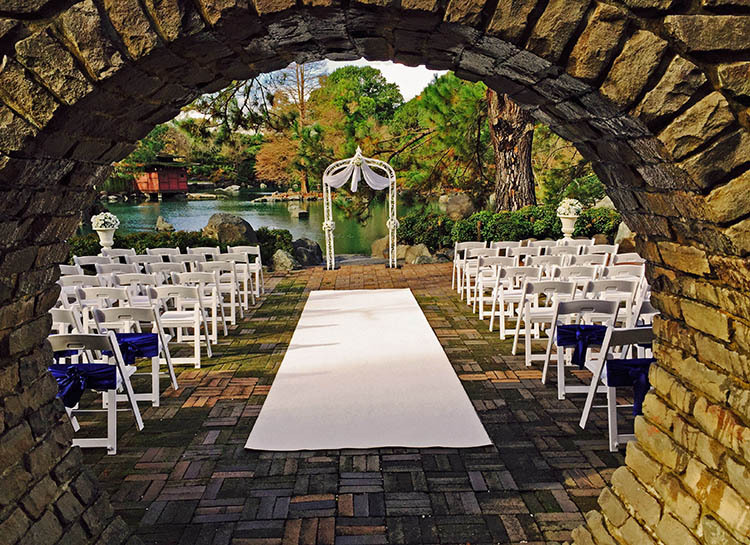 A hidden gem located in Sydney’s west, the Auburn Botanic Gardens is full of features desirable for an outdoor wedding ceremony. There is a choice of garden locations including; the Japanese Garden, the Sunken Rose Garden or the Reflection Pool. Other than the Sunken Rose Garden the areas are intimate and suitable for smaller outdoor weddings. A very popular Canada Bay water view location situated at the end of Phillip Street right next to Angelo’s restaurant. 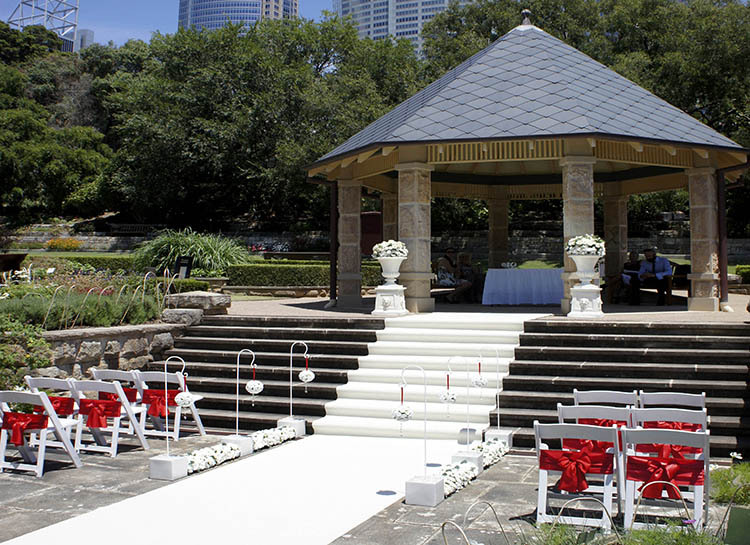 A great location for a smaller more intimate outdoor wedding ceremony, suitable for approx. 50 people. Have more questions or looking to book with Adorable Wedding Concepts? Send your enquiry today and we’ll help you plan your special day. When it comes to wedding styling, there are as many styles, as there are people. Every couple has a unique taste and preference and a good outdoor wedding and decorations company will ensure that’s what shines through in their work. We at Adorable Wedding Concepts are one of the leading companies in this industry and have catered to a large number of clients across the region. We have but one objective- to provide couples with Outdoor Wedding Styling Ideas that are completely in-sync with their personalities. Metallics including silvers and golds- so in outdoor settings, it’s now normal to see some shimmer and shine in the fabrics and materials used. Florals are still trending, but people now prefer heightened flower arrangements, unstructured arrangements and ones that have a more natural styling. The focus is more on the atmosphere as a whole and less about the décor and embellishments. So couples are now asking us for more natural-looking designs and like to incorporate the fairy tale wedding look with a more organic one. Traditional flower arrangements aren’t so popular nowadays and couples are trending towards more minimalistic Outdoor Wedding Styling, than ever before. Nautical- In this, we may use white & navy with some rope detailing. This style works beautifully for a beach wedding. Vintage Rustic: This is a very popular style and many couples request for this particular theme. We use various rustic elements like vintage lace and a canopy to match. Vintage flowers as well as old style chandeliers may also be used. The Glamour quotient- We add this by incorporating white tiffany chairs with silver or gold sashes, orchid floral headers and delightful white draped arches. This goes perfectly with a white aisle runner. Modern Luxe: This is more of a black & white theme. We may use a bamboo archway that has modern black and white decorations. Bohemian- A stunning bamboo canopy that’s been draped with orchids and sheer white fabric provides a stunning backdrop for a wedding ceremony. In addition to these, our designers also draw some wedding styling inspiration from whimsical themes. This is a very fun, feminine and pretty style that is also very simple. We are the multiple award-winning decorators that can provide you the kind of Wedding Styling Hire you require. Feel free to call us at Adorable Wedding Concepts with your wedding event requirements. The number to call is- 0418624225. You can also send us the details about your special day via this online form, and our knowledgeable, friendly and professional experts will call you soon, to discuss the plans and budget. When you are planning an outdoor wedding, you know that the surroundings and the backdrop are the most important aspects; it’s why you plan on organising your wedding in an open space. Despite this, you also want a certain amount of decorations and embellishments. However, there are times when you might have a budget constraint and you wonder whether you will be able to find any good, Cheap Wedding Ideas that will look attractive and enhance the ambience of the space. We at Adorable Wedding Concepts are one of the leading companies in this industry. Since our inception in 2001, we have been blazing trails in the outdoor ceremony and wedding decorations space. Over the years, we have provided customised Wedding Ideas in Sydney to scores of couples and given form to their vision of a perfect wedding. We are very focused on providing our customers value for money; and it’s why we maintain extremely competitive pricing. Even though you will find excellent, Cheap Wedding Ideas with us, we never cut corners in our service or the quality of decorations and solutions we provide. Our experts work very closely with you to understand exactly how you want your wedding to be. Based on everything you discuss with them, they will provide you various options. We strongly believe that it’s not necessary for the decorations at an outdoor wedding location to be ostentatious or elaborate. In our experience, the simple and elegant decorations tend to be more impactful. It is the best way to complement the look and appeal of the outdoor spaces. Arches of flowers– There is something quintessentially charming about arches. We have used arches of flowers and greenery to great effect in many of our outdoor decorating projects. Some couples really like to keep things simple and we work creatively, use minimal embellishments and create a stunning effect with strategically placed arches, at the outdoor wedding venue. Intimate ceremony spaces– There are times when couples tell us that they don’t want the standard arch to hold the ceremony in. In this case, we can provide a very simple yet stunning option- intimate small circular ceremony space, made using greenery and flower s.
Tropical theme- This is a very simple yet arresting wedding idea, and perfect for weddings that are being held in a wooded park or rain forest area. We can very effectively turn a timber arbour into a stunning, organic altar. Fantastic Lighting– This is one of the best Cheap Wedding Ideas that we have found to be immensely effective. No matter what the setting, we can create mood lighting and use fairy lights or antique lanterns, (in case you are having an antique-style wedding), to create spaces that have an ethereal appearance. If you are working on a modest budget, these are just some of the ways in which we can create the perfect effect. We are the multiple award-winning decorators that can provide you the kind of Wedding Ideas in Sydney you require. Feel free to call us at Adorable Wedding Concepts with your wedding event requirements. The number to call is- 0418624225. You can also send us the details about your special day via this online form, and our knowledgeable, friendly and professional experts will call you soon, to discuss the plans and budget. When you’re planning your outdoor wedding, you take extra care to ensure that everything is planned to perfection. This is because outdoor venues are very different from indoor ones and you need to pay extra attention to things like weather conditions, whether the venue has level ground etc. Your guests will be seated for a certain amount of time during the course of the wedding ceremony and you want to make sure that the Outdoor Ceremony Chairs you hire that you opt for are perfect in every way. 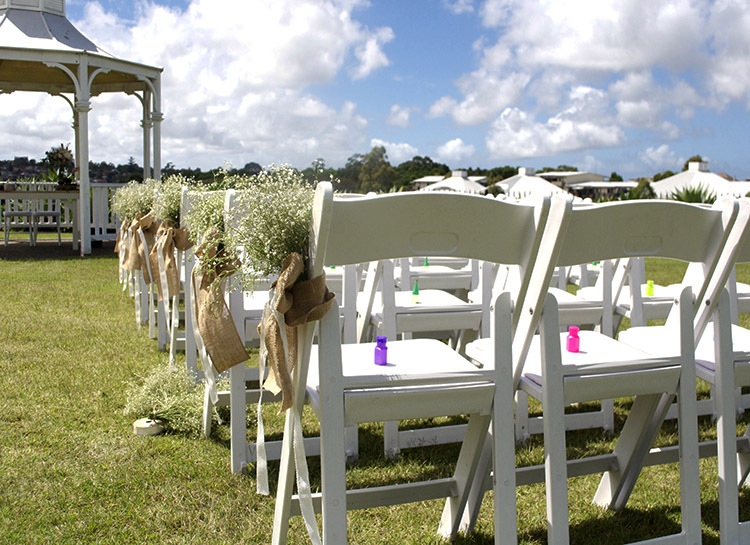 It’s not uncommon to find chairs at a wedding that are wobbly or unstable. This can be quite an irritation point for your guests; they won’t be able to enjoy the ceremony and other going-ons at the event and it also ends up leaving a bad impression on them. However, this situation is easily avoidable. 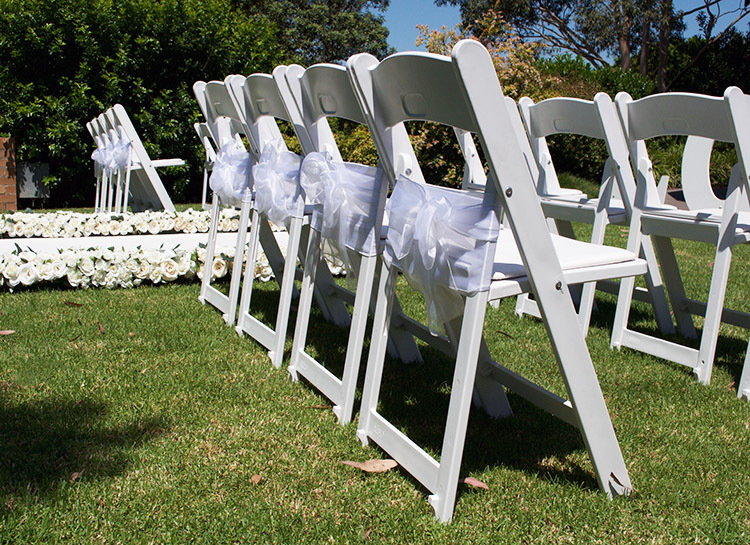 All you have to do is opt for White Wedding Folding Chairs from a reliable company like ours. Adorable Wedding Concepts is a company that has been operating in this space for over 15 years now. We know what it takes to provide our customers the kind of solutions they need. Every wedding is different and different themes are used for the décor etc. It goes without saying that the styling of the furniture should also be in-sync with the rest of the décor and it’s why we provide a variety of chair designs to choose from. We are extremely focused on providing our customers with high grade solutions and its why all the Folding Wedding Chairs are run through very stringent quality checks. We check every single chair before and after the event. This ensures no wobbly, damaged or unstable chairs reach your venue. We provide customised solutions and stunning Wedding Chair Sash Ideas, based on the styling you desire. This helps provide the chairs a customised, elegant look. When you opt to hire chairs from us, you won’t really find your guests complaining about any wobble in their chairs. 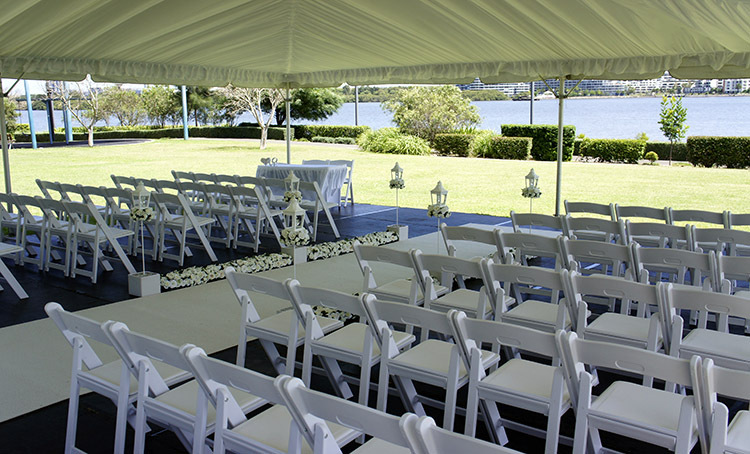 It’s important that the outdoor wedding venue have furniture that’s light and easily movable in case the weather plays up and the furniture has to be quickly moved to a shaded location. This is also why we recommend to our clients that they opt for white folding chairs and tiffany chairs. We can add sashes of your choice to create the look you want. White is also a colour that syncs well with most settings – classic, rustic, contemporary and modernistic etc. In addition to chairs for your guests, we also provide special Wedding Chairs for Bride and Groom. We are the multiple award-winning decorators that can provide you the kind of Folding Wedding Chairs you require. Feel free to call us at Adorable Wedding Concepts with your wedding event requirements. The number to call is- 0418624225. You can also send us the details about your special day via our online enquiry and our knowledgeable, friendly and professional experts will call you soon, to discuss the plans and budget. Weddings are special, and couples take a lot of trouble to plan theirs down to the last detail. They scout various wedding venues and focus on booking one that would provide a unique backdrop and be able to hold the number of guests they plan to invite. While there are scores of beautiful indoor wedding venues, many couples prefer Outdoor Ceremonies. There is a certain charm about getting married in a beautiful garden under the open sky. The idea is to create a very romantic and unique ambience, with all the elaborate decorations and banquets. It does take a certain amount of effort to plan and organise an outdoor wedding such as this; and its best to hire the services of a company like ours to handle all the nitty-grittys for you. 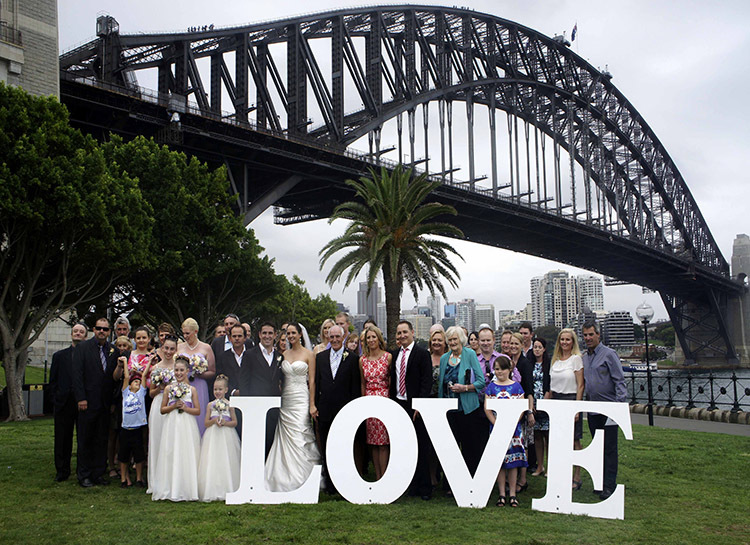 We are one of the most sought-after outdoor ceremony and stylists in Sydney. 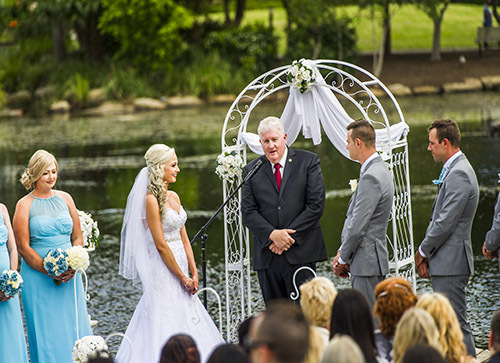 Since our inception in 2001, we have helped create stunning Outdoor Wedding Ceremonies for hundreds of couples, in and around Sydney. 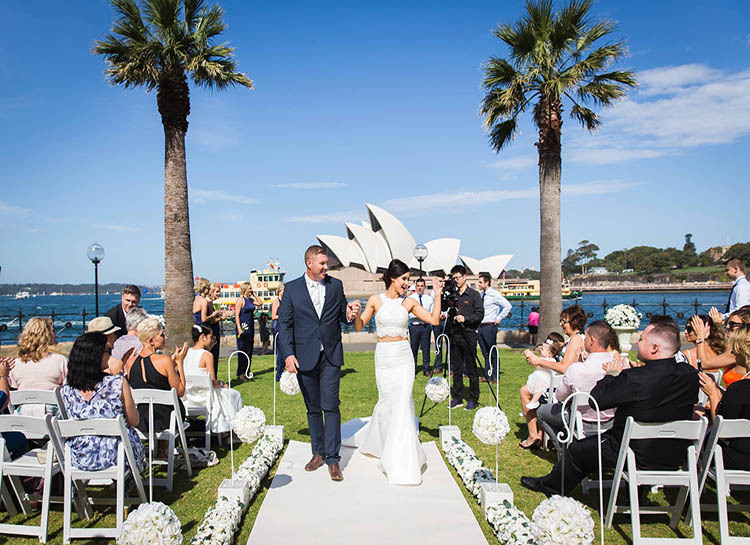 Regardless of whether you want an intimate Outdoor Ceremony in Sydney, with just close family and friends attending, or want a grand, large-scale wedding with hundreds of guests, we can organise it for you. At Adorable Wedding Concepts we work closely with you, to understand your ideas and likes to create a fantastic occasion with all the right features and effects. Our expert wedding decorators work hard to style the right décor, the right colours and features to create a venue that you will love for your wedding ceremony. We never cut corners in our work and never leave anything to chance. Sydney weather can be extremely unpredictable and a sudden shower or blustery weather can easily put a damper on the event. These are the things we focus on and ensure that there is a Plan B in place, just in case the weather doesn’t hold up as we expect it to. With us managing all the details of your Outdoor Wedding Ceremony, you can rest assured that you will have the best setting that will fit in beautifully into your budget. We are the multi-awarded wedding decorators and stylists that can provide you the kind of Outdoor Ceremonies solutions you need. Call us at Adorable Wedding Concepts with your wedding event requirements. The number to call is – 0418 624 225. You can also send us the details about your special day via this online form, and our knowledgeable, friendly and professional experts will call you soon, to discuss the plans and budget.